The illustrations are originals by @Paulcarlonillustration on Instagram. Our local Parkrun is 5km. Recently I decided to take my son. We joined 150 friendly faces gathered together in our neighbourhood field on a Saturday morning. I was a bit apprehensive. I mean 5000m is quite a long way for a 5 year old, right? I didn’t think we’d make it the whole way round. I planned to stop after one lap, praise him for getting that far and say we’d build on it over the coming weeks. The start went well, he enjoyed running as part of the initial large group. 1Km in I asked how he felt and he complained of having sweaty hair. 2Km in I taught him how to have a drink while still moving “like a real runner”, he liked that. We got halfway round and took a knee at the side of the path to catch our breath. I was gulping down some water when he took off running again. Alright then, I guess we are doing this. 39mins later we had finished our first Parkrun. He came second in the Under 10s age bracket and he was pissed he didn’t come first. A 39mins 5K for a 5 year old, I mean that’s some going, right? I ran the route myself midweek to see how fast I could do it and clocked in at 29mins. My 5 year old son is only 10mins slower than I am! The second week he ran it in his Superman costume (I suspect because I’d spent most of the previous week telling him he was my hero). We finished that week in 43mins, I blame the extra drag of the cape. In the third week disaster struck. Within the first 5mins he fell victim to his first “stitch”, that horrible abdominal pain that your body sends you when you are doing something aerobically silly, like running 5K on a Saturday morning! He was crippled. He’d never felt such a pain and could barely put one foot in front of the other. 1. Stop now. Call it a day and limp our way home. 2. Finish the next 4.8Km through a combination of gentle jogging, walking, shuffling, and crying. Being the kind, caring father that I am. I opted to torture my son in the name of an important life lesson. We hobbled our way, holding hands, round the park, twice, to finish in 59mins. Last place. No threat to our PB but we did finish. My poor son, as if shooting pains in his intercostal muscles wasn’t enough he had to listen to me rabbit on about grit and stick-to-it-iveness for 59mins. Thinly disguised allegories about the importance of finishing what you start and pushing through the hard times to achieve your goals. 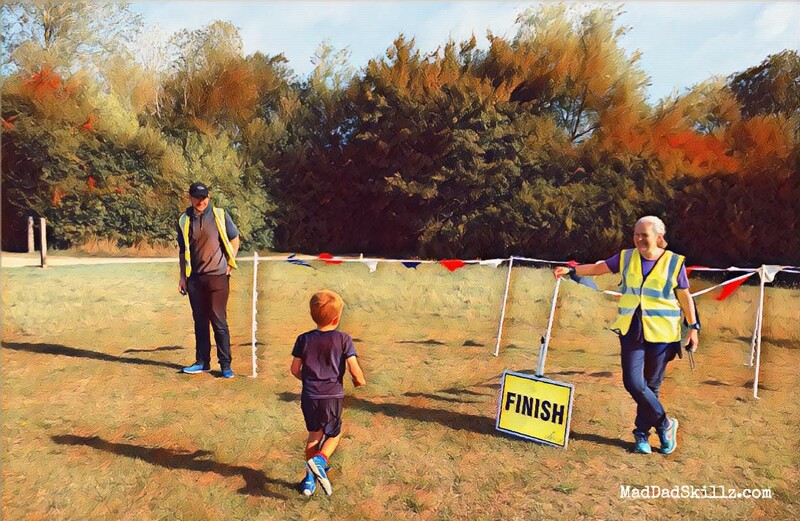 Little did I realise that these Parkruns really were teaching us some important lessons. They’ve taught me to never underestimate my kids. I’m constantly astounded by what they are really capable of. He’s learning to swim and when he gets tired three quarters of the way through his length I ask what we do on the Parkrun when we’re tired? And so the same in the swimming pool. He does maths questions before bed and sometimes he tires and makes excuses about them being too hard. I ask him what happens on our Parkruns when it gets hard? And so the same with our maths problems. Recently, during a particularly complex level of LEGO: BATMAN on the Playstation3 we were struggling to solve the puzzle and he told me. Previous PostGO THE F**K TO SLEEP aka The night I lost it.